Last weekend we bought my wife a new (used) car. Her old(er) one was getting a bit small for our growing boys, and was quickly approaching 100,000 miles (at which point it would become more difficult to sell), so we bit the bullet and took the plunge. Now we have a 12 year-old, 99k-mile car to get off our hands. It’s in excellent shape, by the way. New timing belt and everything, if you happen to be in the market. And on and on and on… A/C ice cold, all electrics flawless, affectionately maintained, Lexus comfort and reliability. Much love to this ride, but my family needs something a bit bigger. Pentagon Federal Credit Union (penfed.org) offers 1.99% financing for up to 60 months on used cars with under 100,000 miles, so you can even finance this piece for $175/month! Waddya got to lose? Email, call or text now: Ninety-one seventy-two 94 seven-thousand eight-hundred and twenty-five. Not bad, right? My wife thought it was funny, as did Mbird’s own award-winning cartoonist Matthew Schneider and about 50 other people who saw it on Facebook before it got taken down. Apparently Craigslist was not so amused. My ad was flagged and removed by early Monday morning. What gives? After submitting a few questions on the Craigslist user forums, I learned that the CL community has almost no tolerance for humor, especially when mixed with any kind of religion. What a bummer. Among the numerous apologies I wrote, I included the somewhat self-justifying thought that Jesus probably didn’t mind, to which I received the very wise (and embarassingly obvious) response: “Jesus isn’t as judgmental as your local audience”(ht Darlin1111)! To be fair, I wasn’t aware that I had “hookerized” my phone number, or that hookerized was even a word. My bad. So what’s the upshot? Well, even being an Episcopal minister (or maybe especially because I am one? ), I still harbor the misconception that the world “out there” is a friendlier and more forgiving place than the world “in here,” i.e. in the church, and that idea was blown apart by this little incident. Not only was Craigslist merciless, but all of my Christian friends (even a few old ladies at my church who had, to my horror, saw the ad on FB) were unconditionally affirming. They thought it was hilarious, and couldn’t understand how anyone else would think anything different. 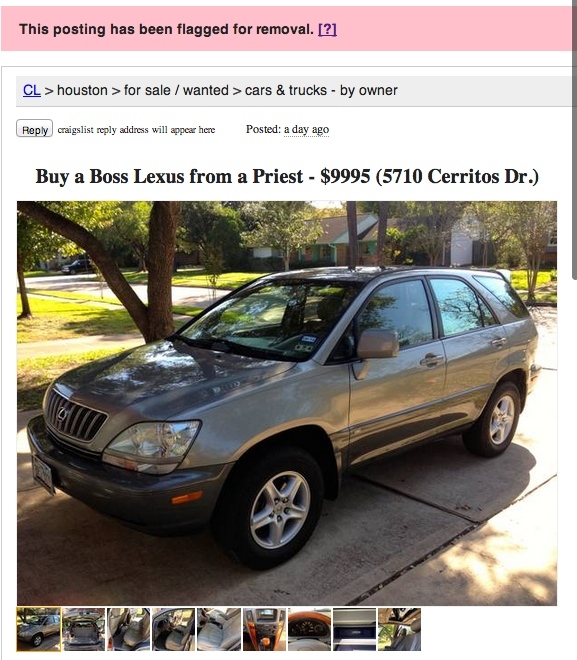 And let me know if you’ve got any interest in procuring a dope whip from a cleric. $9995. That’s a great interest rate on a used car. yes it is. barely keeps up with inflation. it’s like I’m giving the car away. I would have bought the car on the strength of the ad alone. As for the take-down: the US must be a strange place to live these days. Oh nee!!! Alles behalve dat! Oh, my, what is this world coming to? Priests making jokes? Next thing you know, people will be looking at platypuses and claiming that God Himself has a sense of humor. What about the tires? You didn’t mention the tires.